In solid organ transplant recipients, analysis of circulating cell-free DNA (cfDNA) offers advantages over invasive tissue biopsies for detection of rejection and immunotherapy surveillance. A by-product of cell death, cfDNA can be used to assess allograft injury by measuring donor-derived cfDNA (dd-cfDNA) against the background of recipient cfDNA. dd-cfDNA is quantified by analytically validated clinical-grade next-generation sequencing assay utilizing single nucleotide polymorphisms distributed across the genome to differentiate donor and recipient cfDNA. Credit: CareDx, Inc.
An advantage of the new next-generation sequencing (NGS)-based amplification assay is that it does not require determination of the donor’s and recipient’s genotype, a process which requires significant time, cost, and tissue availability. Although tissue biopsy is another way to monitor a transplanted organ, it is invasive, time consuming, costly, and risky. The new assay can be completed within three days, which can be important for clinical decision-making. The researchers expect the assay to be useful for monitoring other types of transplanted organs. Additional multi-centered observational studies for heart and kidney transplant patients are underway to further evaluate the assay’s clinical validity and utility. The assay is currently validated only for single organ donor/recipient pairs. “These results show promise in using cfDNA not only to detect rejection, but also to monitor response to treatment. 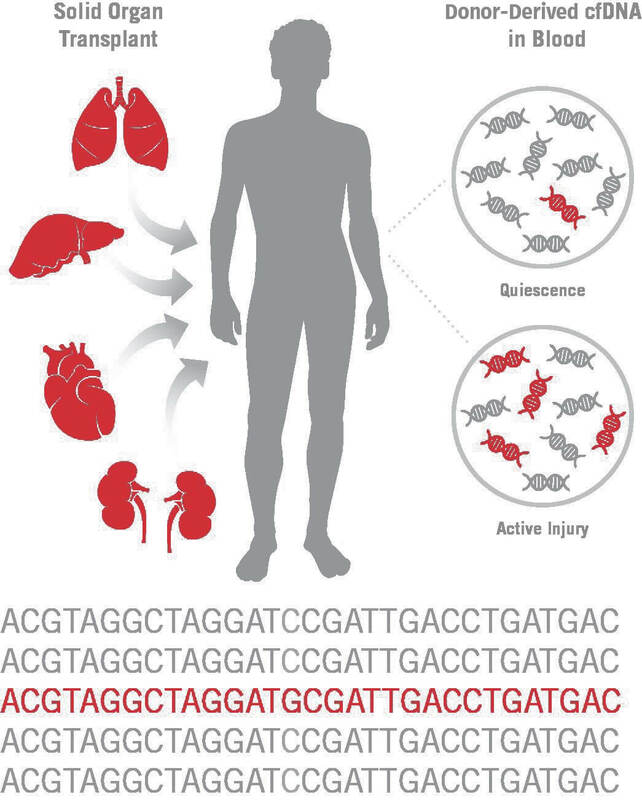 The ongoing measurement of cfDNA may allow clinicians to better personalize care, adjust immunosuppression regimens, and improve the long-term outcomes of transplant recipients,” noted Dr. Grskovic. The article is "Validation of a Clinical-Grade Assay to Measure Donor-Derived Cell-Free DNA in Solid Organ Transplant Recipients,” by Marica Grskovic, David J. Hiller, Lane A. Eubank, John Sninsky, Cindy Christopherson, John P. Collins, Kathryn Thompson, Mindy Song, Yue S. Wang, David Ross, Mitchell J. Nelles, James P. Yee, Judith C. Wilber, Maria G. Crespo-Leiro, Susan L. Scott, and Robert N. Woodward DOI: http://dx.doi.org/10.1016/j.jmoldx.2016.07.003), published online in advance of The Journal of Molecular Diagnostics, Volume 18, Issue 6 (November 2016) by Elsevier. Supported by CareDx, Inc. The content of this announcement is the sole responsibility of the authors and does not necessarily represent the official views or imply endorsement of the NIH. Full text of this study is available to credentialed journalists upon request; contact Eileen Leahy at +1 732-238-3628 or jmdmedia@elsevier.com. Media contact for journalists wishing to schedule interviews with the authors is Todd Whitson, CareDx, Inc., at +1 415-287-2542 or twhitson@caredx.com. For scientific inquiries contact Marica Grskovic, CareDx, Inc., at +1 415-287-2547 or mgrskovic@caredx.com. The Journal of Molecular Diagnostics is the official publication of the Association for Molecular Pathology, co-owned by the American Society for Investigative Pathology, and published by Elsevier, Inc., seeks to publish high quality original papers on scientific advances in the translation and validation of molecular discoveries in medicine into the clinical diagnostic setting, and the description and application of technological advances in the field of molecular diagnostic medicine. The editors welcome review articles that contain: novel discoveries or clinicopathologic correlations, including studies in oncology, infectious diseases, inherited diseases, predisposition to disease, or the description of polymorphisms linked to disease states or normal variations; the application of diagnostic methodologies in clinical trials; or the development of new or improved molecular methods for diagnosis or monitoring of disease or disease predisposition.